This report will cover much of what creatine has to offer as a safe and inexpensive supplement with an exceptionally wide range of potential uses. Learn more about this great supplement right here! Effects Of Creatine On Older Adults. The Secret Of Aging: Cellular Energetics. Creatine Effects On The Brains. Creatine & The Healthy Brain. Although creatine offers an array of benefits, most people think of it simply as a supplement that bodybuilders and other athletes use to gain strength and muscle mass. Nothing could be further from the truth. People who don't follow the research on creatine are often stunned to find out how much research has been done, and how many health, fitness, and longevity uses creatine may have. Why the mainstream media has ignored this fact - in favor of outlandish poorly substantiated scare stories - is unclear, but there has always been a double standard in the mainstream media when it comes to nutritional supplements. Creatine is proving to be one of the most promising, well researched, and safe supplements ever discovered for an exceptionally wide range of uses. Creatine is formed in the human body from the amino acids methionine, glycine and arginine. The average person's body contains approximately 120 grams of creatine stored as creatine phosphate. Certain foods such as beef, herring and salmon, are fairly high in creatine. However, a person would have to eat pounds of these foods daily to equal what can be obtained in one teaspoon of powdered creatine. Creatine is directly related to adenosine triphosphate (ATP). ATP is formed in the powerhouses of the cell, the mitochondria. ATP is often referred to as the "universal energy molecule" used by every cell in our bodies. An increase in oxidative stress coupled with a cell's inability to produce essential energy molecules such as ATP, is a hallmark of the aging cell and is found in many disease states. Prevent the decline in ATP synthesis, which reduces whole body ATP levels. It would appear that maintaining antioxidant status (in particular intra-cellular glutathione) and ATP levels are essential in fighting the aging process. It is interesting to note that many of the most promising anti-aging nutrients such as CoQ10, NAD, acetyl-l-carnitine and lipoic acid are all taken to maintain the ability of the mitochondria to produce high energy compounds such as ATP and reduce oxidative stress. The ability of a cell to do work is directly related to its ATP status and the health of the mitochondria. Heart tissue, neurons in the brain and other highly active tissues are very sensitive to this system. Even small changes in ATP can have profound effects on the tissues' ability to function properly. Of all the nutritional supplements available to us currently, creatine appears to be the most effective for maintaining or raising ATP levels. In a nutshell, creatine works to help generate energy. 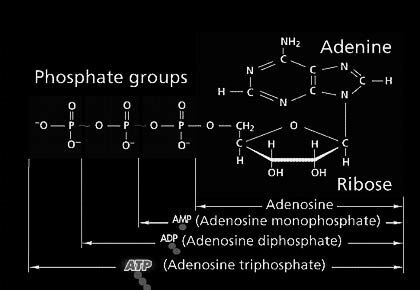 When ATP loses a phosphate molecule and becomes adenosine diphosphate (ADP), it must be converted back to ATP to produce energy. Creatine is stored in the human body as creatine phosphate (CP) also called phosphocreatine. When ATP is depleted, it can be recharged by CP. That is, CP donates a phosphate molecule to the ADP, making it ATP again. An increased pool of CP means faster and greater recharging of ATP, which means more work can be performed. This is why creatine has been so successful for athletes. For short-duration explosive sports, such as sprinting, weight lifting and other anaerobic endeavors, ATP is the energy system used. Creatine has had spotty results in affecting performance in endurance sports such as swimming, rowing and long distance running, with some studies showing no positive effects on performance in endurance athletes. Whether or not the failure of creatine to improve performance in endurance athletes was due to the nature of the sport or the design of the studies is still being debated. However, the vast majority of research to date showing creatine to have positive effects on pathologies, muscle mass and performance used the monohydrate form. Creatine monohydrate is over 90% absorbable, contrary to what some companies and "gurus" have claimed. What follows is a review of some of the more interesting and promising research studies with creatine. So What Can Creatine Potentially Do For Me?" Sarcopnia & The Potential Role Of Creatine. Creatine has been shown to increase strength and muscle mass in young adults in literally dozens of studies at this point. However, there was scant data examining its effects on older adults until more recently. One of the greatest threats to an aging adult's ability to stay healthy and functional is the steady loss of lean bodymass (muscle and bone in particular) as they age. The medical term for the loss of muscle is sarcopenia, and it's starting to get the recognition it deserves by the medical and scientific community. For decades, that community has focused on the loss of bone mass (osteoporosis) of aging adults but paid little attention to the loss of muscle mass which effects a person's ability to be functional as they age just as much - if not more so - then a loss of bone mass. What defines sarcopenia from a clinical perspective? Sarcopenia can be defined as the age-related loss of muscle mass, strength and functionality. One thing is very clear: it's far easier, cheaper, and more effective to prevent sarcopenia, or at least greatly slow its progression, then it is to treat it later in life. Sarcopenia generally appears after age of 40 and accelerates after the age of approximately 75. Although sarcopenia is mostly seen in physically inactive individuals, it is also commonly found in individuals who remain physically active throughout their lives. Thus, it's clear that although physical activity is essential, physical inactivity is not the only contributing factor to sarcopenia. Just as with osteoporosis, sarcopenia is a multifactorial process that may include decreased hormone levels (in particular, GH, IGF-1, and testosterone), a lack of adequate protein and calories in the diet, oxidative stress, inflammatory processes, as well as a loss of motor nerve cells. With aging and inactivity, most atrophy an aging person's muscle mass is seen in the fast twitch (FT) fibers which are recruited during high-intensity, anaerobic movements (e.g., weight lifting, sprinting, etc.). Interestingly, these are exactly the fibers creatine has the most profound effects on. "Creatine supplementation enhances isometric strength and body composition improvements following strength exercise training in older adults"
(J Gerontol A Biol Sci Med Sci. 2003 Jan;58(1):11-9.) fed twenty-eight healthy men and women (above 65 years old) either 5 grams per day of creatine or placebo using a random, double-blind protocol for 14 weeks. Both groups were put on a resistance training (weight training) regimen for the duration of the study. Fourteen weeks of resistance exercise training resulted in significant increases in all measurements of strength and functional tasks and muscle fiber area for both groups. "The addition of creatine supplementation to the exercise stimulus enhanced the increase in total and fat-free mass, and gains in several indices of isometric muscle strength." "Data indicates that 7 days of creatine supplementation is effective at increasing several indices of muscle performance, including functional tests in older men without adverse side effects. "Creatine supplementation may be a useful therapeutic strategy for older adults to attenuate loss in muscle strength and performance of functional living tasks." Yet more studies (Creatine supplementation combined with resistance training in older men. Med Sci Sports Exerc. 2001 Dec;33(12):2111-7.) has come to similar conclusions. However, it should be noted that not all studies have found this effect (Effects of creatine monohydrate ingestion in sedentary and weight-trained older adults. Acta Physiol Scand. 1998 Oct;164(2):147-55.) but they were earlier studies that may have had some methodological flaws. Regardless, the bulk of the data, in particular the recent data, clearly points to creatine as having positive effects on strength and body composition in older adults, especially when combined with a resistance training exercise protocol. "Withdrawal from Creatine had no effect on the rate of strength, endurance, and loss of lean tissue mass with 12 weeks of reduced-volume training." However, it's the experience of most creatine users, as well as most studies in younger adults, that the positive effects of creatine do in fact fade over time if one stops using creatine. Thus, being there is no particular reason to go off creatine once started, best effects will probably come from continues use. What's really the major difference between an older adult and a younger adult? Cellular energetics is the answer: the ability of each cell in our body to regulate its ability to produce energy (e.g., ATP), detoxify harmful compounds, and defend itself against free radical damage and other assaults. A younger persons' cells are quite efficient at dealing with those problems faced by the cell, an older person's cells, be it brain cells, muscle cells, etc. are unable to deal with these challenges, and over time damage accumulates, and the cell dies. In younger healthy adults, old cells are replaced by new healthy cells rapidly, but that's not the case the older we get. The decline in muscle mass (sarcopenia) with aging may be related to a decline in mitochondrial function. Without these high energy compounds, which every cell in our body depends to function, the cell and the entire organism (us!) dies. Want To Build Muscle Fast... Finally? Get the FACTS on exactly how, what & when to eat to achieve maximum lean muscle gains with minimum bodyfat in record time, & discover precisely which muscle building supplements you need to be using to achieve those goals. You can download the book NOW: Learn More Here! It's been established that older adults tend to have lower tissue levels of creatine phosphate (CP), ATP, and other essential high energy molecules. Older individuals appear to respond differently to exercise also in terms of replenishing these essential molecules after exercise. One study called "Skeletal muscle mitochondrial function and lean body mass in healthy exercising elderly" (Mech Ageing Dev. 2003 Mar;124(3):301-9.) measured mitochondrial function and recovery time in , 45 older (average age 73), and 20 younger subjects (average age 25) who were matched for body mass. "Our data suggests that mitochondrial function declines with age in healthy, exercising elderly adults and that the decline appears to be influenced by the level of physical activity." Translated, not only did the older subjects have lower levels of essential high energy compounds (e.g. ATP, CP, etc.) to begin with compared to the younger group, it was made worse the more intense the exercise! As the studies above with older adults show, creatine in supplemented form can ameliorate some of that decline. Creatine may be one of the most effective and safe non-prescription compounds currently available to improve cellular energetics (the ability of the cells to produce energy which keeps us alive!) and may be an effective treatment for sarcopenia, especially when combined with the proper exercise regimen. Increase or maintain intra cellular glutathione and improve mitochondrial anti oxidant status (to prevent mitochondrial damage to DNA caused by reactive oxygen species) by taking anti oxidants and or nutrients known to improve anti oxidant status (e.g. whey protein, NAC, etc). It would appear that maintaining mitochondrial anti oxidant status (in particular intra cellular glutathione) and ATP levels, is an essential combination in fighting the aging process as well as combating/preventing a host of diseases. in experienced runners after running 30km. Runners were supplemented for 5 days prior to the 30km race with 4 doses of 5g of creatine and 15g of maltodextrine per day while the control group received the same amount of maltodextrine. Pre-race blood samples were collected before running the 30km, immediately after the race, and 24 hours after the end of the run. As one would expect, the control group had large increases in CK, LDH, PGE2, and TNF-alpha concentrations. In fact, there was over a four fold increase in CK, 43% increase in LDH, over a 6 fold increase in PGE2, and a doubling of TNF-alpha! "These results indicate that creatine supplementation reduced cell damage and inflammation after an exhaustive intense race." There are a few comments and questions to be made regarding these findings. Regular exercise is an essential component for any person looking to improve their health, keep bodyfat low, retain essential muscle mass as they age, etc., but it also has it's downsides, such as increased free radical production and other effects the body has to combat. Creatine may be a key nutrient here. However, it's unclear if it works in more moderate physical endeavors (as not everyone is running 30km races all the time!) and whether it would have the same effects on inflammatory markers in non-exercising people. None the less, the results are compelling and add to the long list the potential benafits of creatine. Perhaps the most compelling use for creatine is its effects on brain function and metabolism. I covered some of those effects in the past two articles but research continues to show creatine is a key nutrient for brain function and metabolism in both people with healthy or damaged/diseased brains. Traumatic brain injuries affect thousands of people each year. The real tragedy however is that much of the damage to the brain is not caused by the immediate injury, but due to cell death caused by ischemia (a lack of blood flow and oxygen to tissues) and free radical damage/oxidative stress. Even small changes in ATP can have profound effects on the tissues' ability to function properly, which can cause damage and or death for the cell. Of all the nutritional supplements available to us currently, creatine appears to be the most effective for maintaining or raising ATP levels. "...administration of creatine ameliorated the extent of cortical damage by as much as 36% in mice and 50% in rats. Protection seems to be related to creatine-induced maintenance of mitochondrial bioenergetics." "This food supplement may provide clues to the mechanisms responsible for neuronal loss after traumatic brain injury and may find use as a neuroprotective agent against acute and delayed neurodegenerative processes." This study would indicate creatine therapy should be initiated as soon as possible after traumatic brain injury. People who have already been taking creatine on a continuous basis may be afforded considerable protection against additional damage to the brain following such an injury. "Oral creatine monohydrate supplementation improves brain performance: a double-blind, placebo controlled, cross-over trial"
"Results agree with previous observations showing that brain creatine levels correlate with improved recognition memory and reduce mental fatigue." Though creatine supplementation would probably have a less dramatic effect on non-vegetarians -due to the fact they get some creatine in their diet from the meat they eat - it stands to reason creatine will still be effective for improving creatine levels in the brain of meat eaters and vegetarians alike. Healthy and injured brains alike appear to benefit from creatine! One of the most promising areas of research with creatine is its effect on neuromuscular diseases such as MD. One study looked at the safety and efficacy of creatine monohydrate in various types of muscular dystrophies using a double blind, crossover trial. Thirty-six patients (12 patients with facioscapulohumeral dystrophy, 10 patients with Becker dystrophy, eight patients with Duchenne dystrophy and six patients with sarcoglycan-deficient limb girdle muscular dystrophy) were randomized to receive creatine or placebo for eight weeks. Another group of researchers fed creatine monohydrate to people with neuromuscular disease at 10 grams per day for five days, then reduced the dose to 5 grams per day for five days. "Creatine administration increased all measured indices in both studies." Short-term creatine monohydrate increased high-intensity strength significantly in patients with neuromuscular disease.2 There have also been many clinical observations by physicians that creatine improves the strength, functionality and symptomology of people with various diseases of the neuromuscular system. If there is one place creatine really shines, it's in protecting the brain from various forms of neurological injury and stress. A growing number of studies have found that creatine can protect the brain from neurotoxic agents, certain forms of injury and other insults. "... cells supplemented with the precursor creatine make more phosphocreatine (PCr) and create larger energy reserves with consequent neuroprotection against stressors." "... oral administration of creatine produced a dose-dependent improvement in motor performance and extended survival in G93A transgenic mice, and it protected mice from loss of both motor neurons and substantia nigra neurons at 120 days of age. Creatine administration protected G93A transgenic mice from increases in biochemical indices of oxidative damage. Therefore, creatine administration may be a new therapeutic strategy for ALS." Amazingly, this is only the tip of the iceberg showing creatine may have therapeutic uses for a wide range of neurological disease as well as injuries to the brain. Because it is known that heart cells are dependent on adequate levels of ATP to function properly, and that cardiac creatine levels are depressed in chronic heart failure, researchers have looked at supplemental creatine to improve heart function and overall symptomology in certain forms of heart disease. It is well known that people suffering from chronic heart failure have limited endurance, strength and tire easily, which greatly limits their ability to function in everyday life. Biopsies were also taken from muscle to determine if there was an increase in energy-producing compounds (i.e., creatine and creatine phosphate). Interestingly, but not surprisingly, the ejection fraction at rest and during the exercise phase did not increase. However, the biopsies revealed a considerable increase in tissue levels of creatine and creatine phosphate in the patients getting the supplemental creatine. In particular the researchers looked at levels of ammonia and lactate, two important indicators of muscle performance under stress. Lactate and ammonia levels rise as intensity increases during exercise and higher levels are associated with fatigue. High-level athletes have lower levels of lactate and ammonia during a given exercise than non-athletes, as the athletes' metabolism is better at dealing with these metabolites of exertion, allowing them to perform better. This study found that patients with congestive heart failure given 20 grams of creatine per day had greater strength and endurance (measured as handgrip exercise at 25%, 50% and 75% of maximum voluntary contraction or until exhaustion) and had lower levels of lactate and ammonia than the placebo group. This shows that creatine supplementation in chronic heart failure augments skeletal muscle endurance and attenuates the abnormal skeletal muscle metabolic response to exercise. Supplementing with high energy precursors such as creatine monohydrate appears to be a highly effective, low cost approach to helping these patients live more functional lives, and perhaps extend their life spans. Walter MC, et al. Creatine monohydrate in muscular dystrophies: A double blind, placebo-controlled clinical study. Neurology 2000 May 9; 54(9): 1848-50. Tarnopolsky M, et al. Creatine monohydrate increases strength in patients with neuromuscular disease. Neurology 1999 Mar 10; 52(4): 854-7. Protective effect of the energy precursor creatine against toxicity of glutamate and beta-amyloid in rat hippocampal neurons. J Neurochem 1968-1978; 74(5). Malcon C, et al. Neuroprotective effects of creatine administration against NMDA and malonate toxicity. Brain Res 2000; 860(1-2): 195-8. Matthews RT, et al. Creatine and cyclocreatine attenuate MPTP neurotoxicity. Exp Neurol 1999; 157(1): 142-9. Balestrino M, et al. Role of creatine and phosphocreatine in neuronal protection from anoxic and ischemic damage. Amino Acids Abstract 2002; 23(1-3): 221-229. Matthews RT, et al. Neuroprotective effects of creatine and cyclocreatine in animal models of Huntington's disease. J Neurosci 1998; 18(1): 156-163. Ferrante RJ, et al. Neuroprotective effects of creatine in a transgenic mouse model of Huntington's disease. J Neurosci 2000; 20(12): 4389-97. Klivenyi P, et al. Neuroprotective effects of creatine in a transgenic animal model of amyotrophic lateral sclerosis. Nat Med 1999; 5(3): 347-50. Gordon A, et al. Creatine supplementation in chronic heart failure increases skeletal muscle creatine phosphate and muscle performance. Cardiovasc Res 1995 Sep; 30(3): 413-8. Andrews R, et al. The effect of dietary creatine supplementation on skeletal muscle metabolism in congestive heart failure. Eur Heart J 1998 Apr; 19(4): 617-22. Broqvist M, et al. Nutritional assessment and muscle energy metabolism in severe chronic congestive heart failure-effects of long-term dietary supplementation. Eur Heart J 1994 Dec; 15(12): 1641-50. Park JH, et al. Use of P-31 magnetic resonance spectroscopy to detect metabolic abnormalities in muscles of patients with fibromyalgia. Arthritis Rheum 1998 Mar; 41(3): 406-13.